Mauritius may boast itself of being a first-choice destination for golfers looking for new challenges. It stands as an Eldorado for investors willing to adopt a new exotic and relaxing lifestyle. A double challenge to which Azuri, the vibrant liefestyle villa is ready to cater for. In fact, building on its commercial success, Azuri has announced late 2016, the construction of a 9-hole golf course combining technicality for expert players and pleasure for amateurs. A golf course which is intended to be the perfect place for family and friends to take pleasure in wholesome fun and time together, as well as occasions for business matches between clients and associates. The keen player looking to play a quick round of golf, has not been left aside. To refine this new offer, the promoter has also announced the construction of 17 villas bordering and facing the golf course. Built on individual land plots exceeding 10,000 m2, these 3 or 4-bedroom villas boast a living space ranging from 284 to 317 m2. Their architecture focusses on well-defined lines and rectangular-shape structures, underlying a harmonious construction, in line with nature. The villas have been designed as one-storey units: the entrance heads to the living spaces and the kitchen which open onto a large terrace bordering a plunge pool. 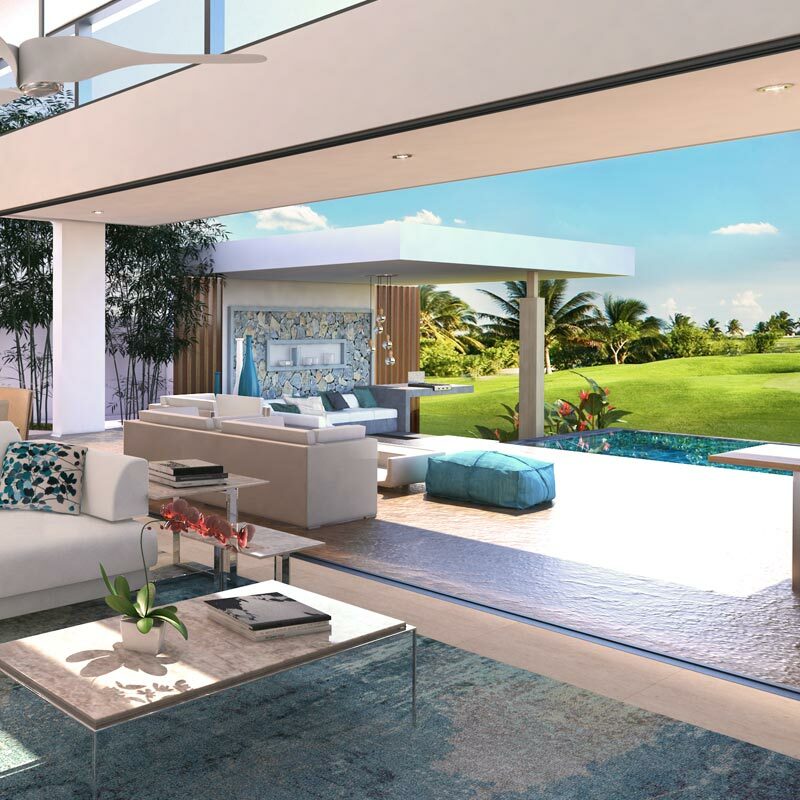 The villas’ layout features a perfect balance between the large aerated living areas on the one hand, and the cosy bedroom spaces, all of which offering great openness over the exterior and breath-taking views over the golf course. The passageway from the interior of the villas to the pool and garden has been designed to as smooth as possible. Large bay windows allow maximum natural light as well as a light breeze. Each villa comes with canopies and pergolas which stand as an invitation to lounge in the shade of the mesmerising scenery, enjoying the magical setting with outstanding view over the golf course. Next to the pool, stands a 20-m2 trendy intimate gazebo, open on 3 sides: an invitation to farniente or a welcoming moment among friends. Azuri represents the very image of Mauritian laid-back lifestyle. Ideally located on the north-eastern coast of the island, this all-year-round vibrant village today hosts more than 200 residents who have embraced the perfect setting for a relaxing beachfront art of living.